Our first TAG scenario, Imp Hollow, is set in Athebes, an ancient land of jungles and savannah, where elves compete with jackal-headed humanoids on the steppes, where ape sages ponder secrets lost in the jungles ages ago, and humans are strange barbaric outsiders. In the land of Athebes, in between the dusty crags of Claag Harragk and the fierce jungles of Djung, is the forest of Afyr. The "Wilder Folk" slipped into its deep shadows and thick hedges as the trolls, elves, and sliths came forward to shape the world of Elder. This part of the world is so wild that the old god Walking Jungle Lady and her "wilder-magick" avatars still roam here from time to time. Afyr is also the home of outcasts from other societies of the land of Athebes, many of whom practice the Old Religion, considered a form of black magic in these modern times. The old forests of Afyr seem to look after them and actively persecute those that pursue them. These creatures, often being terribly misunderstood themselves, tend to welcome even creatures that others would deem "evil" as long as they don't overstay their welcomes. It is in Afyr that our assembled group of heroes has heard about a place called Imp Hollow. In this hollow there is said to be a great treasure and the key to many ancient secrets of the world of Elder. The book is written by Tom K. Loney and features fantastic art by John Armbruster, Diego Gisbert Llorens, Andy Hopp, Régis Moulun, and more! Imp Hollow sells for only $7.99 direct from our printer. You can download a RuinCrawl character sheet here. Want to try out the system for less than a dollar? 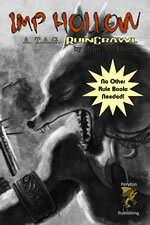 Download our TAG RuinCrawl Rules here. All content (including but not limited to stories, games, other text, and graphics) is Copyright © 2007 by Peryton Publishing or the original author, and may not be reproduced without prior written permission. Peryton Publishing and the Peryton Publishing logo are Trademarks of Peryton Publishing. All Rights Reserved. Email open@perytonpublishing.com for more information.